1850s: son of Jitsukawa Enzaburô I, his first stage name was Jitsukawa Entarô I. He made his debut as a child-actor (koyaku). 2nd lunar month of 1865: Jitsukawa Enzaburô I and his son Jitsukawa Entarô I took the names of Jitsukawa Gakujûrô II and Jitsukawa Enzaburô II at the Naka no Shibai, performing together in the new year ni-no-kawari drama "Keisei Koi no Sekifuda"; the new Enzaburô played the roles of Yurugi Umanosuke and Oume in this drama. 4th lunar month of 1866: Enzaburô played the role of Sakuramaru in the drama "Sugawara Denju Tenarai Kagami"; the roles of Matsuômaru and Umeômaru were played by Nakamura Sôjûrô and Nakamura Nakasuke II. 2nd lunar month of 1867: Enzaburô played at the Naka no Shibai the roles of Sonobe Saemon and Rai Tarô Kunitoshi in the drama "Shin Usuyuki Monogatari". 22nd day of the 2nd lunar month of 1867 : his father Jitsukawa Gakujûrô II died. 11th lunar month of 1868: Enzaburô played at the Kitagawa no Shibai the roles of Oguri Hangan and the artist Sôtan in the drama "Hime Kurabe Futaba Ezôji". He also played the roles of the servant Yoshirô and Kyûsaku in the drama "Osome Hisamatsu Ukina no Yomiuri". 5th lunar month of 1869: Enzaburô played at the Chikugo no Shibai the role of Kinshôjo in Chikamatsu Monzaemon's drama "Kokusen'ya Gassen"; the roles of Kanki, Rôikkan and Watônai were played by Bandô Hikosaburô V, Nakamura Jakuemon I and Arashi Rikan IV. He also played the role of Kichisa in "Date Musume Koi no Higanoko"; the roles of Yaoya Oshichi, Dozaemon Denkichi and Yaoya Kyûbê were played by Arashi Rikan IV, Ichikawa Danzô VI and Nakamura Jakuemon I. 8th lunar month of 1869: Enzaburô played at the Naka no Shibai the role of the Eirakuya tedai Yôsuke in the drama "Sumidagawa Gonichi no Omokage"; the role of Hôkaibô was played by Bandô Hikosaburô V.
11th lunar month of 1869: Enzaburô played at the Kita-Horie Ichi-no-Gawa Shibai (Ôsaka) the role of Kamiya Jihê in the drama "Shinjû Ten no Amijima"; the role of Magoemon was played by Nakamura Jakuemon I. He also played the roles of Ono no Komachi, the courtesan Sumizome and the spirit of Komachi's cherry tree in the dance-drama "Seki no To"; the role of Sekibê (in reality Ôtomo no Kuronushi) was played by Bandô Hikosaburô V.
5th lunar month of 1870: Enzaburô played at the Minamigawa no Shibai the role of Osono in the drama "Hikosan Gongen Chikai no Sukedachi"; the role of Rokusuke was played by Bandô Hikosaburô V.
8th lunar month of 1870: Enzaburô played at the Naka no Shibai the roles of Minamoto no Yoshitsune and Yasuke (in reality Taira no Koremori) in the drama "Yoshitsune Senbon Zakura". 1st lunar month of 1871: Enzaburô played at the Kado no Shibai the roles of Sakuramaru and Otoki in the drama "Tenmangû Aiju no Meiboku" . 5th lunar month of 1871: Enzaburô played at the Kado no Shibai the role of Osome in the drama "Shinpan Utazaimon". 1st lunar month of 1872: Enzaburô played at the Kado no Shibai the role of Oguri Hangan in the drama "Hime Kurabe Futaba Ezôji". 4th lunar month of 1872: tour in Himeji with Nakamura Sennosuke, Onoe Taganojô II, Jitsukawa Yaozô I, Kataoka Gadô III and Ichikawa Ebijûrô V.
9th lunar month of 1872: Enzaburô made his last stage performance, in Ôsaka at the Kado no Shibai; he played the role of Fujiya Izaemon in the drama "Kuruwa Bunshô"; the roles of Ôgiya Yûgiri, Yoshidaya Kizaemon and Kizaemon's nyôbô Okisa were played by Ichikawa Udanji I, Mimasu Daigorô V and Jitsukawa Yaozô I. 7th of the 10th lunar month of 1872 : Enzaburô died in Ôsaka. Jitsukawa Enzaburô II became extremely popular in the Kamigata area at the end of the 1860s and the beginning of the 1870s, especially in the city of Ôsaka. 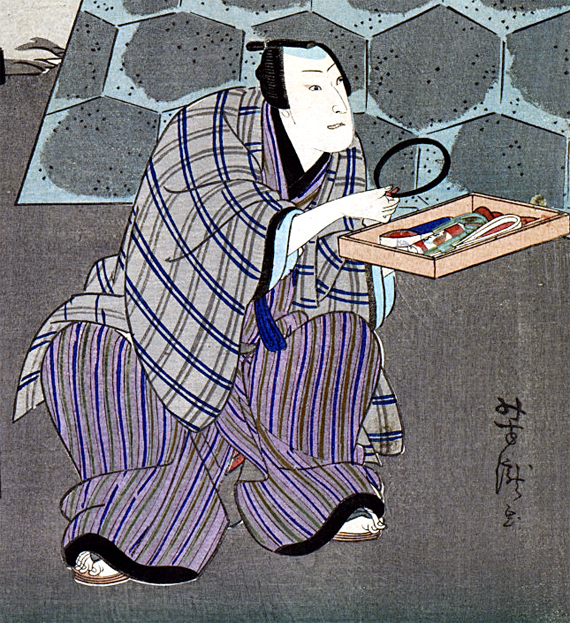 He could have become one of the leaders of Kamigata Kabuki but he unfortunately died too young. The 7th day of the 10th lunar month of the 5th year of the Meiji era was the 7th of November 1872 in the western calendar. The 22nd day of the 2nd lunar month of the 3rd year of the Keiô era was the 27th of March 1867 in the western calendar. A drama based on the sekai of the classic "Sugawara Denju Tenarai Kagami".